On September 9, 2008, the United States District Court in Manhattan ordered the New York Police Department (NYPD) to provide all of its UF-250, or “stop-and-frisk,” 1 data from 1998 through the first half of 2008 to the Center for Constitutional Rights (CCR). Judge Shira Scheindlin ruled that the NYPD failed to prove that the law enforcement privilege protects the NYPD from having its questionable stop-and-frisk practices exposed to public scrutiny and further, that all of the data, other than personal identifying information of police officers and persons stopped, could be made available to the public. The NYPD's use of stop-and-frisk is on the rise. In 2005, the NYPD made less than 400,000 stops in comparison to a projected 543,982 stops by the end of 2008. Over a period of 3.5 years, the NYPD has initiated nearly 1,600,000 stops of New Yorkers. The NYPD continues to disproportionately stop-and-frisk Black and Latino individuals. From 2005 to 2008, approximately 80 percent of total stops made were of Blacks and Latinos, who comprise 25 percent and 28 percent of New York City's total population, respectively. During this same time period, only approximately 10 percent of stops were of Whites, who comprise 44 percent of the city's population. Blacks and Latinos are more likely to be frisked after a NYPD-initiated stop than Whites. Between 2005 and June 2008, only 8 percent of Whites stopped were also frisked, while 85 percent of Blacks and Latinos who were stopped were also frisked. Blacks and Latinos are more likely to have physical force used against them during a NYPD-initiated stop than Whites. In addition to rising rates of NYPD use of physical force, the data reveals that a disproportionate number of Blacks and Latinos who are stopped have physical force used against them. In 2005, 19 percent of Whites stopped had physical force used against them , compared to 26 percent of Latinos and Blacks; by the first half of 2008, 18 percent of Whites, compared to 24 percent of Latinos and Blacks, had physical force used against them during NYPD-initiated encounters. Stops-and-frisks result in a minimal weapons yield and/or contraband yield. The data demonstrates a paucity of stops resulting in weapons and/or contraband yield across racial lines. Of the cumulative number of stops made since 2005, only 2.6 percent resulted in the discovery of a weapon or contraband. Though rates of contraband yielded were minute across racial groups, stops made of Whites were slightly more likely to yield contraband. 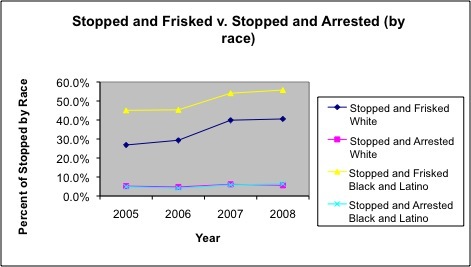 The proportion of stops-and-frisks by race does not correspond with rates of arrest. Arrest rates during the period of 2005 through the first half of 2008 were low for all racial groups at between 4 and 6 percent of all NYPD-initiated stops during that period. The UF-250 data provided by the NYPD plainly demonstrate that Black and Latino New Yorkers have a greater likelihood of being stopped-and-frisked by NYPD officers at a rate significantly disproportionate to that of White New Yorkers. That NYPD officers use physical force during stops of Blacks and Latinos at an exceedingly disproportionate rate compared to Whites who are stopped, and that this disparity exists despite corresponding rates of arrest and weapons or contraband yield across racial lines, further supports claims that the NYPD is engaged in a pattern of racial profiling in its stop-and-frisk practices. The findings of this preliminary review of the data are presented in greater detail therein. NOTE: The data and statistics used to produce this report are available as a Microsoft Excel spreadsheet using this download link. If you are interested in having the entire 2005 - 2008 data set produced by the NYPD (on 1 DVD), please send a request email to stopandfriskdata@ccrjustice.org. A database program such as Microsoft Access will be helpful in reading and interpretting the information. Floyd, et al. v. the City of New York, et al. stems from CCR's landmark racial profiling case, Daniels, et al. v. City of New York, et al. - filed in the wake of the Amadou Diallo shooting – that led to the disbanding of the NYPD's infamous Street Crime Unit and a settlement with the City in 2003. The Daniels settlement agreement required the NYPD to create and maintain a written anti-racial profiling policy that complies with the United States and New York State Constitutions, as well as to provide stop-and-frisk data to CCR on a quarterly basis from the last quarter of 2003 through the first quarter of 2007. A prior analysis of the data revealed that the NYPD engaged in stop-and-frisks without suspicion and based on race. While CCR was in possession of the UF-250 data for these years, all the data and the analysis of it were under a protective order that prohibited release to the public. several policy recommendations and community-based responses to counter racial profiling by local law enforcement. The UF-250 data was produced to CCR as database files for each year required under Judge Scheindlin's Order. Each file contained data from the stops-and-frisks recorded by NYPD officers for the given year. Each database file contains approximately 250 fields, corresponding with fields from the paper-based UF-250 forms that NYPD officers are required to complete each time a stop is initiated. This report includes an analysis of key data fields relevant to the Floyd litigation. Fields analyzed include stops, frisks, arrests, summons, weapons and contraband yield, use of physical force and combinations of these. Non-integer percentage numbers, e.g. 32.72 percent and 32.49 percent, were rounded up by the hundredths decimal to the nearest integer. For example, 32.99 percent is calculated as 33 percent, as is 32.49 percent. The mean number of total stops for years 2005, 2006 and 2007 was 458,926; however, in the first half of 2008, the NYPD made 271,991 stops. If the NYPD continued to make stops at a similar rate during the second half of the year, it will have made 543,982 by the end of 2008, a figure which surpasses the previous record number of 506,491 of total stops in 2006. See Figure 1. The number of frisks conducted by the NYPD continues to increase. In 2007, although the NYPD made 34,000 fewer stops than in the previous year, nearly 28,000 more frisks were conducted for a total of 245,033. During the first half of 2008, the NYPD made 145,323 frisks; based on this trend, it can be projected that over 290,000 frisks will have been conducted by the end of 2008 – a record number of NYPD-initiated street encounters resulting in frisks for any single year of publicly available data. Already, individuals stopped had a 42 to 43 percent likelihood of being frisked by the NYPD in 2005 and 2006, respectively. Since 2007 however, this likelihood increased by 10 percent. This denotes a steady increase in stops resulting in frisks by the NYPD. This is true even for Whites, of whom approximately 28 percent were frisked in 2005 and 2006 and 41 percent were frisked in 2007 and the first half of 2008. Latinos and Blacks continue to have an increased likelihood of being frisked in 2007 and 2008. Latinos had a 44 percent chance of being frisked in 2005 and 45 percent in 2006, increasing to 55 percent in 2007 and the first half of 2008. Similarly, Blacks had a 46 percent chance of being frisked in 2005 and 2006, rising to 54 percent in 2007 and 56 percent in the first half of 2008. See Figure 4. Between 2005 and June 2008, a cumulative total of 775,428 of stops made by the NYPD resulted in frisks. Of the individuals frisked during this period, 59,967, or 8 percent, were White and 660,936, or 85 percent, were Black and Latino. The arrest rates for NYPD-initiated stops have remained markedly low for all racial groups during the period of 2005 through the first half of 2008. In total, just 27,632 arrests were made out of the 472,096 stops in 2007, and only 16,784 arrests resulted from the 271,991 stops made in the first half of 2008. In 2005, only 5 percent of all stops of Whites, 5 percent of all stops of Blacks and 5 percent of all stops of Latinos conducted by the NYPD resulted in arrests. In 2006, 4 percent of stops of Whites, 5 percent of stops of Latinos and 4 percent of stops of Blacks resulted in arrests. The arrest rate increased to 6 percent for all three racial groups in 2007 and the first half of 2008. Based on this data, relatively equal arrest rates for all racial groups fail to account for the striking disparity in stops of Blacks and Latinos versus Whites. See Figure 6. The rate of summons issued for NYPD-initiated stops made in 2005 to the first half of 2008 remained in the range of 6 to 7 percent of stops. Like the rate of stops resulting in arrests, the rate of summons issued after an NYPD-initiated stop are equal across racial lines. 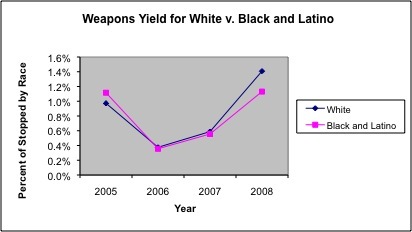 Since 2005, the weapons yield rate has remained equal across racial lines, despite the fact that Latinos and Blacks consistently comprise over 80 percent of total stops. The mean weapon yield rate of stops from 2005 through the first half of 2008 was 0.75 percent of all stops. By year, in 2005, the weapon yield rate was 1.1 percent; in 2006, the weapon yield rate was 0.4 percent of all stops; in 2007, it stood at 0.5 percent of all stops; and, in the first half of 2008 the yield was 1 percent. See Figure 6. The rate of contraband yield from stops made by the NYPD have stayed level and at a minuscule percentage across racial groups. The total percentages of stops resulting in contraband yield are as follows: 1.8 percent in 2005, 1.4 percent in 2006; and, 2 percent in 2007 and first half of 2008. See Figure 7. 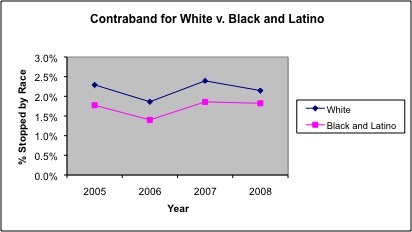 While the percentages are low throughout racial groups, Whites demonstrate slightly higher rates of contraband yield. In 2005, 2.3 percent of Whites stopped resulted in a contraband yield compared to 1.8 percent for Latinos and Blacks; in 2006, the percentage for Whites was 1.9 percent compared to 1.4 percent for Latinos and Blacks; in 2007, the percentage for Whites was 2.4 percent versus 1.9 percent for Latinos and Blacks; and, in the first half of 2008 the percentage for Whites was 2.1 percent versus 1.8 percent for Latinos and Blacks. Regardless of race, an average of 97.6 percent of stops made by the NYPD from 2005 through the first half of 2008 resulted in neither weapons nor contraband yield. 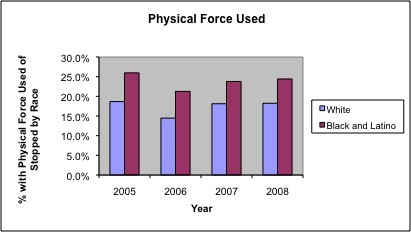 Physical force was self-reported by NYPD officers in 23 percent, or 373,233, of the 1,600,000 stops conducted by the NYPD between 2005 and June 2008. The use of physical force by police officers has a greater likelihood of occurring than arrest or the issuance of a summons combined. The percentage of stops resulting in the use of physical force by an officer was 25 percent in 2005; 20 percent in 2006; 23 percent in 2007; and, 24 percent in the first half of 2008. See Figure 7. 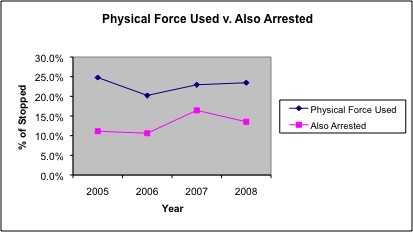 Between 2005 and June 2008, the mean percentage of stops involving the use of physical force by the officer leading to an arrest was 12 percent. In other words, 88 percent, or 328,589 of the 373,233 encounters in which physical force was used, did not result in arrest. See Figure 8. There is an evident racial disparity in the use of physical force used by NYPD officers during stops. In 2005, 19 percent of Whites stopped had physical force used against them, compared to 26 percent of Latinos and Blacks; in 2006, 15 percent of Whites, compared to 21 percent of Latinos and Blacks, endured physical force; in 2007, 18 percent of Whites, compared to 24 percent of Latinos and Blacks, had physical force used against them; and, in the first half of 2008, 18 percent of Whites, compared to 24 percent of Latinos and Blacks, had physical force used against them by the NYPD. As illustrated in this preliminary report, the NYPD's UF-250 data plainly demonstrate that Black and Latino New Yorkers have a significantly greater likelihood of being stopped and/or frisked by NYPD officers than White New Yorkers. The racial disparity in the rate at which NYPD officers use physical force during stops-and-frisks further substantiate Floyd's claims of racial profiling. The disparity is even more distressing when compared to corresponding rates of arrest and weapons or contraband yield by race. CCR seeks judicial remedies through the Floyd case, which will be defined through the course of the litigation. At the same time, CCR advocates for a range of institutional and community-based changes that may overlap, but are independent from, the litigation remedies. Release additional policing and crime data. Greater transparency about NYPD policies and procedures is essential in combating the racial profiling of hundreds of thousands of New Yorkers. Only with publicly available data can the community-at-large determine whether or not the NYPD is acting under the rule of law. Publicly available data should include not only NYPD activities, but data, such as COMSTAT, that informs the NYPD’s policies and procedures. Enforce existing NYPD reporting requirements. The NYPD is currently required to report to the City Council quarterly on the number of stop-and-frisks in every precinct by race and gender. This requirement must be enforced and met consistently. Increase the scope and authority of the CCRB. The Civilian Complaint Review Board (CCRB) was formed in 1993 to receive and review civilian complaints of police misconduct. The CCRB's scope of review, however, is limited to incidents not resulting in arrest. Furthermore, the CCRB's authority is only to offer recommendations, and does not include the authority to take disciplinary action against officers who have engaged in misconduct. While the CCRB is a positive step towards greater accountability from the NYPD, its current capacity prohibits an independent review of misconduct. An effective CCRB requires the increased authority to impose more effective disciplinary procedures based on the findings of their investigation, independent of any input or influence by the NYPD. More effective disciplinary penalties, including a greater number of days of desk duty or lost pay, retraining and even termination, would deter officers from future violations of a policy prohibiting racial profiling. Know your rights. The Fourth Amendment gives individuals the right to be free of arbitrary search and detention. As the UF-250 data presented in this report suggests, this fundamental right is often violated in the name of safety or purportedly effective police practices. It is imperative that individuals and communities know their rights and how to effectively and safely practice those rights in interactions with law enforcement agents. Advocate for a permanent Independent Police Auditor. Communities and advocates can urge policy makers to create a position for a public official or body that would review NYPD practices, policies and data in order to issue recommendations for systemic, department-wide changes. An auditor would assess the failure or success of the police department in implementing its policing policies that are specifically designed to eliminate racial profiling. The auditor would also have the official capacity to investigate compliance with such policies. Organize a community-based CopWatch program. CopWatch programs act as community foot or vehicle patrols, or watch groups that lawfully monitor local law enforcement and observe police stops, searches and arrests. These programs aim to reduce police violence and misconduct by exercising the community's right and ability to hold police directly accountable for their actions. Communities in which the NYPD engages in racial profiling and other rights violations can use the CopWatch programs as an effective way to help deter police misconduct, or expose it when it occurs. For more information, visit PeoplesJustice.org or iWitnessVideo.info. An initial review of the data provides plain evidence that the NYPD has continued to stop, question and frisk an alarmingly high number of New Yorkers each year. The NYPD claims that initiating and conducting nearly 1,600,000 stops-and-frisks over a period of almost 4 years is an effective and legitimate means of crime reduction. The NYPD's own stop-and-frisk data, however, does not support its aggressive stop-and-frisk practices. While Blacks and Latinos are far more likely than Whites to be frisked during an NYPD initiated stop, the percentage of frisks resulting in arrests is correspondingly low across race. This provides strong evidence that the NYPD is not only exceedingly indiscriminate in its frisks of Blacks and Latinos, but also conducts such frisks without reasonable suspicion, raising legitimate concerns that such frisks may be racially pretextual. The remarkably low rates of NYPD initiated stops-and-frisks that result in arrests, summons, weapons and/or contraband yielded make evident the ineffectiveness of this unconstitutional practice. In addition to the illegality and unconstitutionality of unwarranted stops, the racial disparity exhibited in the NYPD's aggressive stop-and frisk practices only serve to strain an already complex relationship between the NYPD and communities of color. The excessive use of physical force in nearly 1 out of 4 stops - particularly when the majority of stops-and-frisks of Latinos and Blacks do not result in arrest - promote continued mistrust, doubt and fear of police officers in communities of color already scarred by major incidents of police brutality. Racial profiling is a violation of fundamental rights and protections of the United States Constitution and the Civil Rights Act of 1964. CCR seeks judicial remedies through the Floyd case, which will be defined through the course of the litigation. At the same time, CCR advocates for a range of institutional and community-based changes that may overlap, but are independent from, litigation remedies, both with the common goal of restoring and protecting the constitutional rights and quality of life for all communities. 1“Stop-and-frisk,” also referred to as “stop-question-and-frisk,” is a practice by which an NYPD officer initiates a stop of an individual on the street. Frisks are legally permitted only when the officer believes the individual poses an immediate threat to the officer or people in the immediate area. Stops may result in arrest or the issuance of a summons to the individual. Stops-and-frisks are often used in “quality of life” policing models. 2This analysis of the data does not necessarily reflect the conclusions, evidence and arguments that will be presented by plaintiffs in the Floyd litigation.